The weather forecast for today on the chalkboard in my hotel reception looked none too rosy. It didn’t fill me with much enthusiasm. 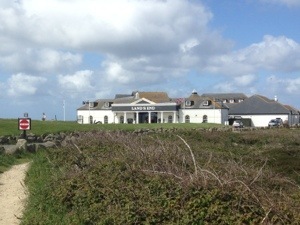 Still, it looked fairly bright so I made an early start and rolled out of Penzance at 9.15am. I passed on the direct road route, instead following my trusty NCN3 around the bay through Newyn, and on to the fishing village of Mousehole. A brilliant name for a cute little fishing village with its own harbour. Had I known about it I would have stopped there last night for sure. From Mousehole the road rose steeply, and a very sweaty 15 minutes later I was cruising along country lanes on between cliff-top fields. It felt like I was going to drop off the end of the country at any moment, but it was just an illusion as I knew there was still more than 10 miles of the route to go. A couple of miles later the steepest downhill yet dropped into a secluded valley and a little village full of houses and artists studios. The sunlight was streaming through the treetops and the woodlands were filled with bluebells and other wild flowers. It was like a secret valley. If I have learnt anything in the last few days it is that what goes down must always come up again, and sure enough it wasn’t long before another thigh burning uphill took me back up to the open fields. The road sign said 5 miles to Lands End, but once again the little blue cycle route signs had other ideas, taking me on a zig zag route along deserted lanes and through tiny villages. I also noted that the ‘cold wind’ was coming from the opposite direction. It was nice to feel the wind at my back for a change, but did it really have to happen on the one day I was planning to do a u-turn and head North? 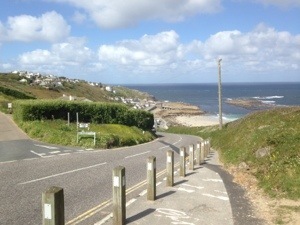 Eventually I reached the sharp descent into Sennen Cove. 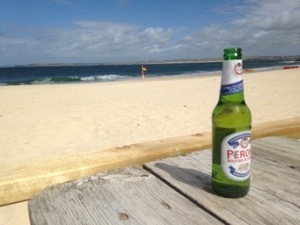 But Cornwall hadn’t finished with me quite yet. The little blue signs delivered a last steep pull through the upper slopes of the village to take me one last mile along the cliff top path to the tourist trap that is Lands End. Beyond the columns it is like a crap miniaturised Alton Towers, so I stopped just long enough to get the obligatory photo. And of course an ice-cream. Instead I had to settle for a Thornton’s equivalent (£2 and quite nice). If a premium ice-cream can retail for two quid in a remote captive market then I can only conclude there has been some failure of market forces in Bath. I suggest the good people of Bath rise up against the over-priced icy treats. Or failing that at least get over to Asda for their 6-for-£3 multi-buy (thanks for the recommendation Dad). Or is the real problem that they only do Waitrose in Bath? 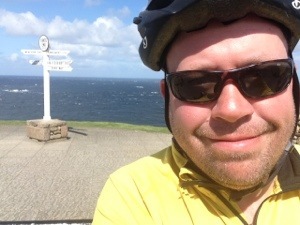 I was planning to ride North to St Ives, but with the headwind I opted for the more direct road route back to Penzance and hopped on the train. I’d nothing left to prove now. While the rest of the country is enjoying miserable weather, there is at least one corner where it’s sunny enough to enjoy a cold beer on the beach. And thankfully I am in it. If you’d like to sponsor, just click the link to donate to Cancer Research. Massive thanks if you already have, since last year you’ve helped raise over £6k including tax relief and corporate cheques.